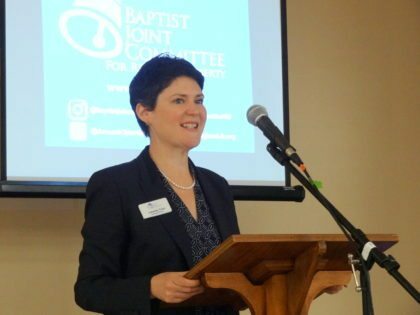 On October 30, Churchnet hosted a breakfast event featuring a presentation by Amanda Tyler, executive director of the Baptist Joint Committee for Religious Liberty. Tyler talked about the historic Baptist heritage of advocating religious liberty for all, with quotations from Baptists like Thomas Helwys, Roger Williams, and John Leland. 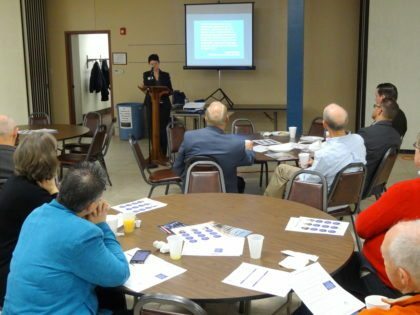 She also talked about the work of the BJC and some current church-state issues like the recent Trinity Lutheran Supreme Court case, efforts to undermine the so-called “Johnson Amendment” that keeps partisan politics out of houses of worship, and the upcoming Masterpiece Cakeshop Supreme Court Case. Attendees came from across the state and represented multiple denominations. Churchnet is a member body of the BJC and is proud to support the work of the BJC in advocating for religious liberty for all. Amanda Tyler speaking Churchnet breakfast event.